Sleeping in is one of the best things in the world. Knowing that there is no need to rush always makes my morning pleasant and relaxing. I am so glad that our group finally got a chance to sleep in because our service at the summer school has officially ended. Waking up at around 9:00 a.m., I washed and got ready for the float trip. We first went to a restaurant for brunch, which was delicious. I ordered the breakfast special and I was surprised by the size of my pancakes. They were HUGE and I couldn’t finish the last one. By the time we walked out the restaurant, everyone was well-fed and satisfied. After a 15-minute drive through downtown Page, we arrived at a gift shop, where we were supposed to wait for the float trip bus. It’s 12:30 pm and the heat was already unbearable. Our group registered at the front desk and sat in the shade to apply sunscreen. Some went into the gift shop. About half an hour later, we boarded the bus and the guide told us to be ready to get wet. Everyone was very excited. The bus went through a long and dark tunnel that brought us from the top of canyon to the bottom, near the dam. After we got off from the bus, we were told to put on hard hats. “Why?” Some asked. The guide explained that people tended to make wishes on the Colorado River Walking Bridge by throwing coins and other stuff. To avoid any “unexpected gifts from the heaven,” all the rafters were required to wear a hard hat. Imagine a group of teenagers in beach clothing wearing hard hats. We are just cool like that, YOLO (You Only Live Once). Anyway, we boarded the float and our river guide Laura was very helpful and nice. She gave us some insights about the Glen Canyon Dam and Glen Canyon, which is much smaller in size than the Grand Canyon. The river water is normally only 47◦F since it is released from hundreds of feet below the lake surface and isn’t warmed by the sun. It was very difficult for me to associate the heat in the air with the chill of the water. When I put my feet into the river water, however, it felt like I was sliding through a glacier in a sweat lodge. Floating in this fire-and-ice combo actually felt amazing after a while. Watching the humongous sandstones on the two sides of the river, I was amazed by this miraculous river. 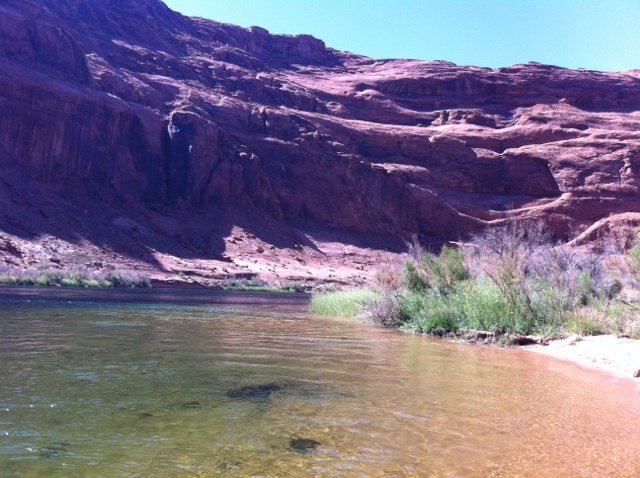 The mix of desert on top of the canyon and the oasis near the river was very fascinating to me. After a several minutes of introduction and casual chatting, Laura finally started the engine and the cool and comfortable breezes blew our sweat away. After a 15-minute drifting on the green river, we anchored at a beach where we had a chance to actually jump into the freezing river and chill. 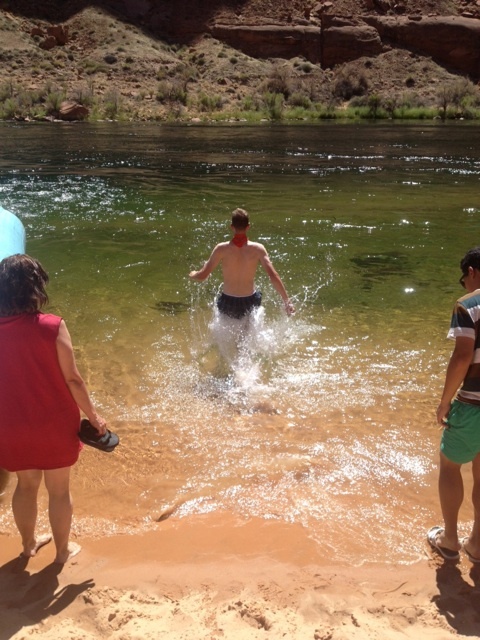 All of us got off the float in a hurry, but no one dared to be the first to dunk himself/herself with the Colorado River. All of sudden, a huge black shadow flashed by and dove into the water. “Joe!” Someone shouted. Then, everybody realized that Joe had made the move and courageously let himself sink into the moving glacier. Following Joe, one by one, we all rushed to get a first-hand experience in the 47-degree water. Most of us went multiple times into the river and ran out of it screaming. Vincent, the only one who stayed in the river more than two minutes, won cheers and admiration from the whole group—a guy that can endure the challenge of 47-degree water. Exceptional! Although watching Vincent and Joe was fun, for most of us our favorite moment was when our cold feet were buried by the warm, sun-kissed sands. That feeling was PARADISE. After we boarded the float again, I think everybody agreed that the thrill and chill at the beach was the highlight of our river float trip. We relaxed and enjoyed the nice weather on way back to the dam. We were all still pretty wet when we boarded the bus again and went through the tunnel, but, by the time we gathered at the gift shop, our clothes were all dry again. How incredible was the Heat (Miami Heat!!!!!)! After a fun day of river-floating and pizza-feasting at the nearby pizzeria at night (with Michael’s “scandalous” lifejacket photo at the pizzeria), we all settled back into our motel rooms and drifted away in our dreams, just like when we were on the float on the Colorado River. Today was our last day in Kayenta. After two weeks of working with the students, it was the last day of summer school and a field day. During the day half of the kids watched a movie inside while the other half played games outside, and at lunch the two groups switched. My group’s favorite game was probably the clothes race, in which two teams had a relay race, but each teammate would have to put on oversized clothes before running. The end of the school day was emotional for all of us. Each of my students gave me a handwritten note thanking me for working with them, and my teacher gave me a traditional Navajo necklace. After all the pictures were taken and the goodbyes were said we helped our students onto their buses and waved goodbye. After two long weeks our service part of the trip was over. I had such a great time helping these children and I’ll miss them all so much. Today was the last day of teaching. I missed two of my boys, Josh and Justin, who didn’t show up and I have no idea if they are going to show up tomorrow, I hope they do. Well, overall today was really good and we had extra time for outdoor exercising in the afternoon. Then it was time to pack up the town house, where we spent a lot of afternoons recollecting ourselves from the exhaustion from school. We went back to our host families to get ready for the thank you dinner for the fabulously generous hosts. The meal was great and we had quite a pleasant visit with our hosts, Mr. and Mrs. Nezi. I’d say they were the best host family because of their great generosity and the spectacular breakfasts they made for us. It was really regretful that we’ve never had a chance to visit their other house, where we can get to know their animals and Hogan. Then it came to the big time. My team, the Miami Heat, won the NBA Champion! Again! I’ve had a nice time watching the NBA finals with Jay, Mr. and Mrs. Nezi’s son. I’m both excited and flustered about tomorrow. It is the field day and also the last day with my students. They’ve been challenging sometimes, but their cuteness and sweetness made every day rewarding. The driving was punctuated by stops at local vendors and small outcroppings with scenic views. I was able to borrow Vincent’s digital camera and take pictures at each stop (some better than others). For dinner we stopped at the View. After eating we had some time to shop around before driving back to our homestays. As we are starting the second week of summer school my kids have shown a greater interest in me. They always want to share their crazy and wild stories about Big Foot and other fantasy characters. During the school today, my teacher and I had a line full of activities starting from reading multiple books about farm animals, doing a math project, and even having a fitness break. Even though today was just like any other school day, my kindergarten students always are full of energy but sometimes need to be pushed to succeed in their work. I am happy to say that I have seen a positive growth in the way my students have progressed throughout these two weeks. Our group also visited Frank Young who works for the Kayenta Outpatient Treatment Center. He talked about how many of his clients have fallen off the balance of the four major elements of being a well-rounded human being. Frank listed them as physical, mental, emotional, and spiritual. He also talked with us about how a horse is often used for therapy purposes when dealing with drug and alcohol abuse. “Horses protect us from evil,” Frank explained. “They are extremely important in the Navajo culture.” He believes that horses can help many patients who may have lost their native culture. After reflecting Frank’s message to us, I have realized that not only has drugs and alcohol influenced the Navajo culture, many places from all over the world are experiencing the same problems. As the days left in Arizona are getting shorter, I my appreciation of the Navajo culture and the way that many of my students live and learn at school has grown. After yesterday’s long and exhausting hike we were all looking forward to getting some rest. It was Monday, however, which also meant it was a school day. Even though all of us were sleepy and sore, we were looking forward to seeing our students at school. The children seemed out of energy and didn’t seem to want to work at first, but soon they were as energetic as ever and ready to do work—and even more ready to play games. Once school was over we went to the townhouse and took the much needed and very well deserved nap. After our nap and a snack, Barb and Michael took us shopping. We were all excited because we were expecting the prices to be much more affordable than some of the gift shops we had been to. 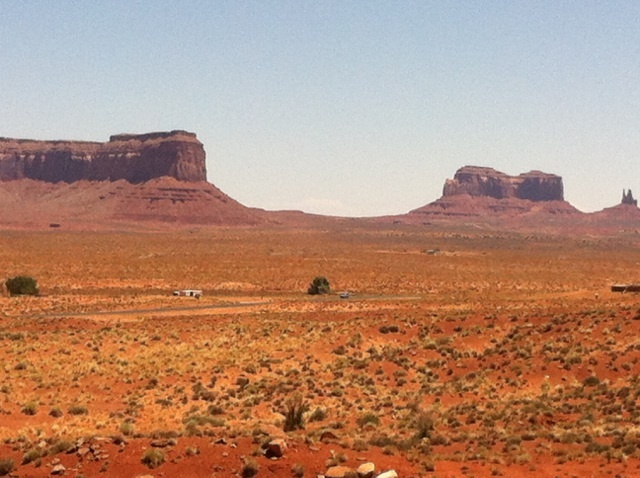 First we went to the Navajo market close to monument valley were we all shopped for ourselves and our families. We thought we were done there but Barb also took us to Gouldings Lodge in Monument Valley where we could shop even more, and we did. 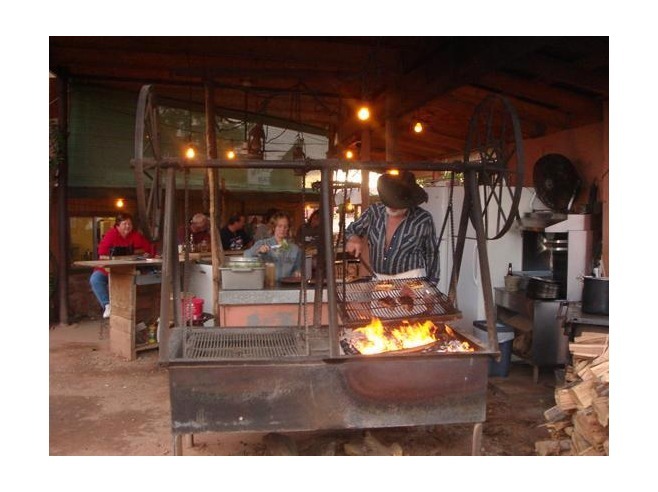 Gouldings Lodge is famous because it was the home of the great western actor John Wayne who has starred in many cowboy movies. We had a great shopping experience. We then went to dinner at Ms. Matthews’ house, the principal of the elementary school. We ate dinner and shared our experiences with Ms. Matthews about the school and our students. We then bid good night to Ms. Matthews, thanked her for the wonderful dinner, and were dropped off at our home stays. It was a wonderful end to wonderful day. We spent this weekend with Lena and her brother Ernie at the base of Black Mesa. Sunday morning we woke up in the Hogan and made breakfast over the fire. After we ate we were ready for the 3 mile hike up the Mesa. The trail was steep and rocky at parts but we followed Ernie and heard some stories along the way. We made it up and rested on the rocks. After we took some pictures and looked out across the valley, we hiked back down to the Hogan to pack everything up. We said goodbye to Ernie and Lena and drove back to the townhouse. We spent the rest of the day bonding as a group then went back to our home stays. This weekend was a major highlight of the trip. Lena and Ernie are amazing, wise people who welcomed us into their family and taught us all about their culture. The first week has gone so fast! 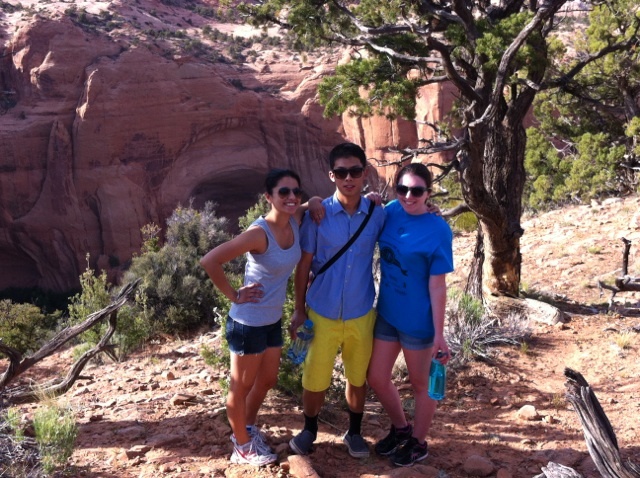 Today we drove to Black Mesa to experience a traditional Navajo weekend. We spent the morning preparing and blessing the Hogan for our campout that night. The boys helped Lena’s brother, Ernie, chop wood and prepare the fire. The girls helped Lena make traditional Navajo food, such as fry bread, blue corn mush, and Navajo cake. We spent the evening around the fire eating s’mores and listening to some of Lena’s wisdom. Lena and Ernie explained to us about their family’s clan and we shared our heritages with the whole group. 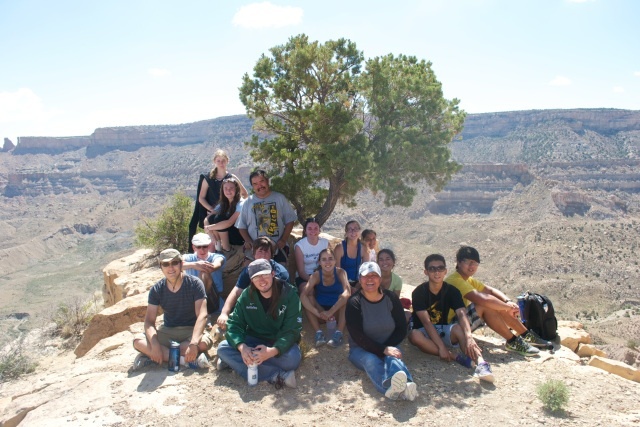 We all slept in the Hogan and looked forward to our hike up Black Mesa the next morning. Today was the last day of our first week of summer school. Many of the students received t-shirt prizes for showing up all five days. They proceeded to model around the school. This happened because many students do not come to school every day, and the prizes are a form of motivation. In my first grade class, only five out of our nine student class came to school today. It’s crazy that I already feel a strong connection with my students after just one week. 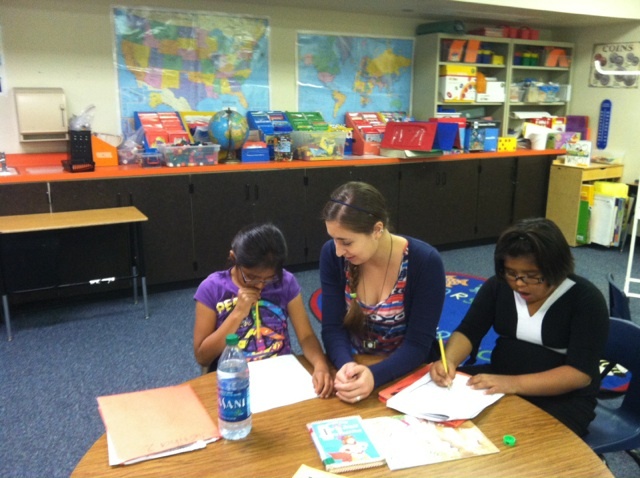 When they do not come to school it impacts the entire feel of the classroom. After a long week the fourteen of us walked back to our town house to relax and prepare to cook our family-style dinner—mac-n-cheese and hot dogs. Afterwards, some of the girls and Michael went exploring a bit, and we walked a mile around the track. Getting some fresh air and clearing our minds was exactly what we needed after our first school-week in the desert. All of us prepared for a huge sleepover in the town house, and we watched my all-time favorite movie: Lost in Translation. The sleepover helped all of us to bond before we left for our campout on Black Mesa for the weekend. Our anticipation for this trip is very high, and we look forward to experiencing this traditional Navajo weekend together. Yesterday afternoon we traveled to Four Corners, traveling through some truly awesome country. 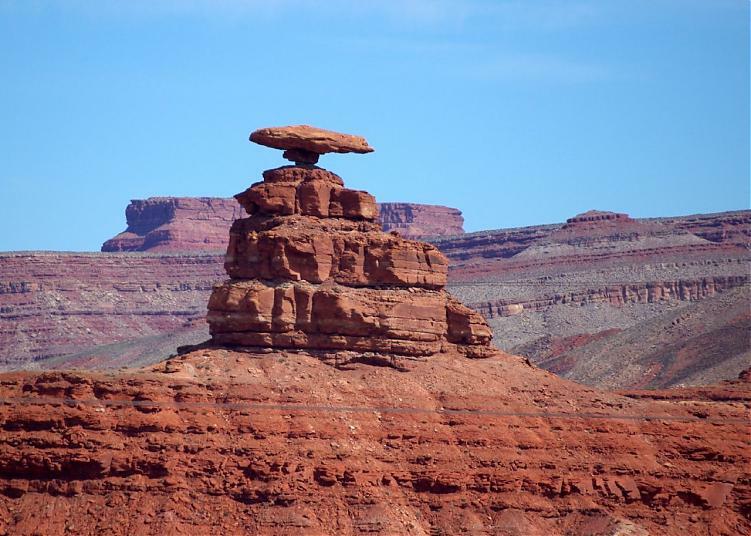 Afterward, we drove to the town of Mexican Hat, Utah, near a rock formation that looks quite like an upside down sombrero perilously perched atop a rocky mound. We ate at a restaurant off the highway, The Swingin’ Steak, where there are only four items on the menu: two different cuts of steak, hamburger, and surprisingly, a veggie burger. A thick slab of Americana, indeed. We drove home at dusk, past Monument Valley on the way back to Kayenta, the desert looking majestic as we cut through the twilight. We all worked hard today, continuing our teaching and service learning, and tonight we’ll head back to Monument Valley. As of today, we’ve put over 600 miles on our workhorse Dodge Caravans.